PRAGUE – Petra Kvitova began firing and she wouldn’t quit. The 23 year old knew exactly what he would do on a super-fast hard court and she was swinging away. Yes, she did throw in a couple of sweet drop shots, but other than that, she banged the balls and believed that she would out hit Andrea Petkovic. She could not. Although Petkovic moved much better in the second set, she was always behind. Petkovic had to deal with more pressure and, when she didn’t, she went down fairly quickly. Kvitova decided that she wasn’t concerned about different tactics. The tall lefty hooked her serves that would swerve out wide. Petkovic would try to get the balls back in, but the Czech was all over the returns, which she powered out of the German’s reach. The world No. 14 Petkovic is pretty fast, but the balls were racing like lightning. So it didn’t matter that should couldn’t get into the points. 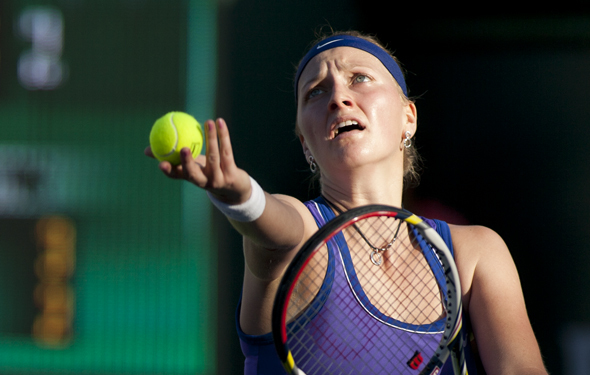 The German had to start attacking immediately but Kvitova punched her lights out. Up 5-1 in the first set, Kvitova went into a walkabout and she was broken to 5-2, but she came right, smoking on a backhand down the line. Petkovic pushed her hard in most of the second set, but could the German disturb Kvitova? She could not. Petkovic fought off break points serving at 3-4 with two terrific serves. In the next game Kvitova nailed a big ace to go 5-4. Then the pressure rose and Petkovic could not settle down. With the 12,000 sold out screaming, at 30-all, the German missed a simple slice that flew away and a forehand that disappeared. She was gone and Kvitova once again showed that more than anyone of the top 10, she has committed to Fed Cup time and time again. Kvitova scored 25 winners, while Petkovic only came up with seven. World no. 10 Angelique Kerber of Germany went out to fast and furious, and was up 4-2 in the first set, but No. 17 Lucie Safarova had other plans. Safarova has been pretty good since 2007, when the now 27-year-old can knock out some of the better players, but she has rarely been a major factor in the Slams. However, the lefty reached the 2014 Wimbledon semifinal, which shows that she doesn’t mind if she has to bend low. In fact, she likes to move quickly, set up for a shot and swing it super hard. Two years ago, Kvitova was ill and Safarova has to close out the Czech Fed Cup final in Serbia. Safarova was electric, crushing Jelena Jankovic to the win 2012 Fed Cup in Prague. Now, she was ready again, knowing that she could knock out Kerber if she was willing to be more aggressive. The two had more rallies than Kvitova and Petkovic did, but which of the lefties would swing out? That was Safarova, who knew exactly where and when she should go for her shots. At 5-4 on set point down, Kerber crushed her forehand and believed that Safarova wasn’t going to touch it. So Kerber yelled in delight, but Safarova had run over. Kerber said, “Come on” very loud. However, Safarova hit the ball and returned. The chair umpire calls it a hindrance, so Kerber lost her point and the set. Kerber kept trying and broke, but Safarova rushed forward and was willing to hit out anytime she could. At 5-4 in the second set, Safarova cracked a forehand and nailed an overhead to get to match point. Kerber fought off two match points when the Czech was a bit wild. But Safarova finished her off, when Kerber rushed to the net and instead of crisply knocking it away, she lazily put it in the middle of set and Safarova stroked a forehand into the corner. Lucie grinned after another win, this time 6-4, 6-4. The Germans were afraid, while the Czechs were dancing on their heads. Safarova ended with 20 winners, while Kerber could only manage 10. The Czechs are up 2-0 and are ready to go on Sunday. Kvitova will start with either Kerber or perhaps Sabine Lisicki, who would sub in. Lisicki has fast burners, reaching on the 2013 Wimbledon final, but she has not played great this fall in the past six weeks. Her German coach, Barbara Rittner, might change another coach, but Kerber is there best player overall and she would be saddened if she had to sit. Safarova will play after Kvitova if the top Czech is upset, but won’t care if she faces Petkovic or Lisicki. She has a healthy amount of ultra confidence. MVP Safarova proved more than a find No. 2 to No. 1 Kvitova in 2012. PRAGUE — How many women love slick courts? Not many, that’s for sure. But Petra Kvitova would prefer to hit as hard as she can … just booming it. Forget it about engaging 30-plus rallies; she would rather wipe her serves into the corner and break them way out wide. Even if it’s punched back by one of her opponents, she will step in and power her forehand for a winner. Kvitova has won two Grand Slams, in 2011 and 2014 at Wimbledon. Her foes in the finals, Maria Sharapova and Genie Bouchard, couldn’t even blink as the Czech hit with power so quickly that they couldn’t touch her shots. That is exactly what Kvitova has done for the Czech Republic in the Fed Cup: She was her lights out, nailing the corners and winning two of the past three Fed Cup finals at home in Prague. And guess what … she can do it all over again. Coming up this weekend in Prague, the world No. 3 will be favored again. The Czechs, including Lucie Safarova, were tough and aggressive in 2012 when they stomped Serbia’s Ana Ivanovic and Jelena Jankovic to win the title. Kvitova was not perfect that weekend, as she was sick, and Ivanovic played well to grab one of the points. But, in the end, the Czechs won anyway because the left-handed Kvitova kept swinging and Safarova was on ultra-speed. This is different though. Kvitova has become more mature during the last year or so, but she knows that she cannot go on a walkabout. They will play against Germany, led by Angelique Kerber and Andrea Petkovic, both of whom say that they know to keep balls in play until the tall Kvitova grows tired and wild. The 24-year-old Kvitova says she is faster than she was as a baby back in 2008 when she played her first time in Fed Cup. She could only split against Israel, but they won anyway. From then on, she kept on playing in the team competition. Kvitova loves Fed Cup so much that she has played 15 times already. She has played twice against Germany before, in 2010 in World Group at home when she beat Petkovic and lost to Anna-Lena Groenefeld but the came through anyway. Then she won a classic match in 2012 when the Germans chose hard courts, but Kvitova edged Julia Goerges 10-8 in the third set and then out-pushed Sabine Lisicki in the third set. But, it really doesn’t matter what strategy German captain Barbara Rittner employs. The key is whether or not Kvitova can make big swings and find the lines. If she does, the Czechs will win the Fed Cup again and Petra will once again be perfect.